London Fletcher played 16 NFL seasons, and knows a good quarterback when he sees one. Now an NFL analyst with CBS Sports, Fletcher blasted the Redskins and their handling of RG3, primarily Jay Gruden failing at his job. “Win football games,” co-host Eric Bickel responded. Fletcher’s points are beyond fair, and seem similar to other critics and pundits who believe Gruden should be fired. Fletcher believes Gruden blew it, and RG3 will eventually become a good player somewhere else. “When they hired Jay Gruden, they put Robert ahead of the team. …” Fletcher said. 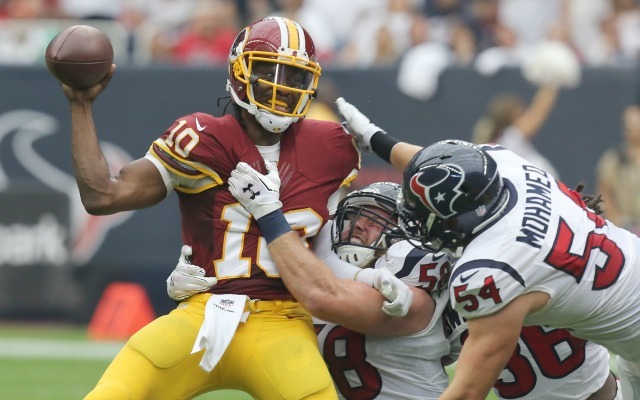 “When they hired Jay Gruden, they put Robert ahead of the team, in terms of he needed to develop. … Did [Gruden] really try?” he continued. “Within one year, he’s tried, so. So you’re not a good coach if you can’t continue to develop a guy. He’s not going to get better sitting on the bench as a quarterback. “Don’t hold him on the bench. Don’t say he has a future with the Washington Redskins if he doesn’t. Because he’s not going to get better sitting on the bench. Not at the quarterback position.